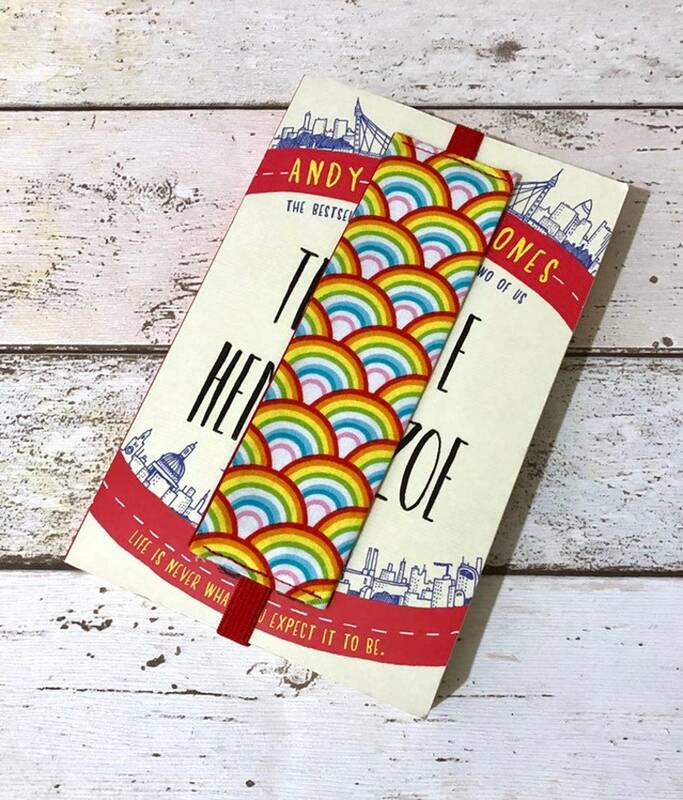 Rainbow Elastic Bookmark - a unique Fabric Bookmark ideal for keeping your place when you close your book. Made from 100% cotton, with a colourful Art Deco style rainbow design to front and a coordinating yellow polka dot or plain red backing. A double layer of sturdy interfacing has been added for a firmer finish. Small bookmarks are great for paperbacks - they measure 6.5" long/2" wide with approx 10" of red or yellow, flat elastic. Large bookmarks are ideal for hardbacks and measure 8" long/2" wide with approx 12" elastic. The elastic is stitched into the bookmark to wrap around the pages of your book, to both mark where you're up to and to help prevent the bookmark from falling out of your book! Please contact me if you would like to arrange a custom order. Please note that the book in the photographs is shown for demonstration purposes only. This listing is for the bookmark only. Each bookmark is handmade to order and therefore pattern placement may vary. Love this purchase! Well made and super cute! Very protective to my books when they’re in a bag. Roomy enough to carry a couple normal sized paperbacks or my book and maybe a notebook/pan or tarot deck too! Acabado genial, muy original y precioso!! Thank u for this book cover. It is so classy n protects my book especially in my overcrowded bag. I love it n im going to order one for my large Bible. Thank you! Please contact me if you would like your item gift wrapping and sent direct to the recipient. Examples of previous gift wrapped items can be found on my social media pages.